Most opinions are settled even before the experience is done. ‘X’ and ‘M’ sharing the bootlid is the death of the brand according to die-hard enthusiasts. 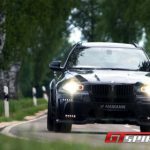 BMW’s newest and most controversial M model is the 2010 BMW X6 M. A vehicle which is hard to figure on paper, but still as fast around the Nurburgring as the current BMW M3. 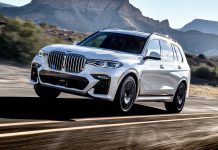 A combination between a massive 555-horsepower twin-turbo V8, SUV ride height, hatchback body style and the M badge of BMW’s Motorsport division it is one the most ridiculous rides available on the market today. The other one is – exactly – its twin high-riding brother named the X5 M. So what are the exact stats? The ‘standard’ X6 M has a twin-turbo 4.4 liter V8 producing 555hp and a 501lb-ft of torque available throughout most of the rev range. A run to 100km/h (62mph) takes just 4.7 seconds and top speed is a limited 250km/h (155mph). Although if you opt for some BMW Driver Training as part of a special M Driver’s package, you can get raised up to 280km/h (175mph). So what is the deal here with this Hamann Tycoon Evo M. At first, it is a BMW X6 M somewhere underneath; secondly it got ‘some’ refinements ranging from the bodykit to the interior and from the wheels to the engine. Clear task for us to check out the improvements and find out if the level of the ridiculously increased or decreased. Before even starting to discuss the ‘enhancements’ lets start with the feel on the road. The BMW X6 M is one massive cannonball in a straight line. Secondly, its handling capabilities are like those of a sport sedan with a battalion of high-tech aids and technology. The X6 M has a natural tendency towards understeer. If you select Sport, the Electronic Damping Control (EDC) and Active Roll Stabilization (ARS) help to mitigate the effects under load. The AWD system features BMW’s torque-vectoring Dynamic Performance Control (DPC). It distributes the power between the rear wheels to maintain a constant cornering attitude no matter the conditions you are in. The most astonishing factor is the lack of body roll. The vehicle stays relatively flat even in tight corners, even with respect to its curb weight of 2380kg or 5,324 pounds. Outfitted to the test vehicle are massive 23 inch rims in the dimensions 11.0×23 at the front and 12.0×23 at the rear axle, combined with wheels measuring 315/25 R23 and 5mm wheel spacers. They do not improve the ride at all, but the suite the package as such. The ride becomes more bumpy, less comfort and losses a bit of its handling capabilities. All logical when you change 20 inchers for size 23. The German tuner has various wheel sets available varying in wheel designs and sizes. If requested the wheels can be accompanied by a kit lowering the vehicle by approximately 40mm. It was not installed on the vehicle displayed. The V8 is among the quickest, most linear turbocharged engines we have driven, it runs so fluently. The six-speed automatic with manual shift paddles is the only available transmission. Flappy paddles are connected to the steering wheel giving you the option to shift, but the engine revs so quickly that the best suitable option is to leave it on automatic. The whole combination brings one big smile on your face. Additionally launch control is available if you need it! Standard the X6 M does 0-100km/h (62mph) in 4.7 seconds. The standard amount of horsepower is achieved at 6,000rpm, with a peak torque of 680Nm (501lb-ft) available from 1,500 to 5,650rpm. The party ends at 7,000rpm. Hamann’s improvements with respect to the engine shed a different light on these figures. 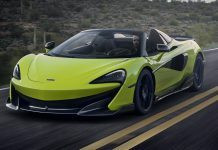 The technical program includes a stainless steel high performance exhaust system with metal catalysers and a newly programmed map for the serial motronic extending the speed limit up to 300km/h. They kept the standard common manifold system. The improvements offers 670hp at 6,000rpm and 780Nm torque at 1,500 – 5,650rpm. This is an increase of 115hp and 100Nm compared to the serial version. From 0 to 100 is improved by half a second up to 4,2 seconds. 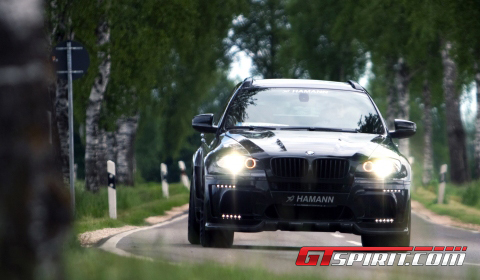 If requested, Hamann can boost the engine up to a point that 3,6 seconds from 0 to 100km/h is possible. Not only the performance increase is noticeable after an initial drive, but the exhaust track sounding through the sedan cabin of the SUV is new to any existing X6 M driver. The soundtrack of the high performance exhaust system is similar for both systems available and improves over time due to the kilometer-age covered. The test vehicle was equipped with the center exhaust setup including to massive end-pipes. A second system with pipes on either side of the vehicle is available as well. The sound inside fills the cabin with a reasonable volume level that increases in tone when the twin-turbo kicks in. At higher speeds it is music in your ears not even in the interior but also for the spectators feeling the mastodon passing by raising the hairs on the back of their necks. 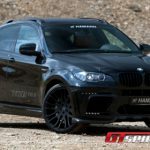 The Hamann body kit is a true matter of taste, but improves the rather boring and dull looking package of the standard X6 M up to a point that it now suites the recipe for irrelevance. It holds front and rear wing extensions made of light composite materials. The body expands by 60 millimeters. The designers enhanced the sides with the newly designed side skirts. The front apron has four or two striking LED daytime running lights depending on the country you life in. The air inlets in the front and the carbon bonnet allows an optimized air ventilation of the engine compartment. 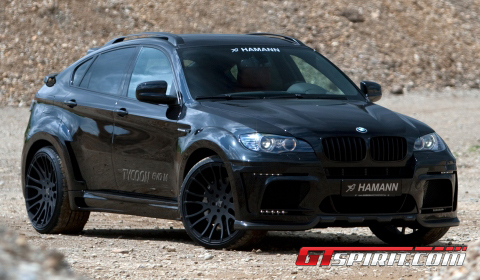 At the X6 M rear, Hamann replaced the original skirt and added new rear- and roof spoilers. The standard interior does not feel as special or different as other M cockpits. If you do not notice the three M badges dotted around the cabin, you could be in a regular X6. Although, it is one of the most elegant cabins BMW has ever built. The construction is precise, the materials are high-quality and the instrumentation is crystal-clear. As expected, the M sport seats provide superb support and comfort. Additionally, Hamann offers accessories made of black-anodized aluminium in combination with 12-part set of carbon applications. New pedals, foot rest and three-spoke sports steering wheel are on the option list. For the luggage compartment a boot mat with diamond-shaped decorations and an embroidered logo is also available. A special Alcantara roof liner including LED lighting was included in the test car. The design of the LED lighting depends on the owner’s wishes and has the ability to change color. BMW offers an extensive option list which includes xenon headlamps, headlight washers, front and rear parking sensors, a panoramic sunroof, auto-dimming mirrors, leather upholstery, eight-way power heated front sport seats, a sport steering wheel, ambient interior lighting, dual-zone automatic climate control, Bluetooth, iDrive communication system, a six-DVD changer, an iPod/USB adapter, a 16-speaker premium sound system, a rearview camera, a head-up display, soft-close automatic doors, ventilated “multicontour” seats, heated steering wheel, heated rear seats, four-zone climate control, keyless entry/ignition, extended leather trim, a rear-seat entertainment system, satellite radio and towing preparation. Overall coming to a conclusion is not really difficult in the case of the BMW X6 M. The German manufacturer has made a big, tall, heavy, sedan-looking truck that handles like a performance car, but we are wondering why this was needed. It doesn’t look like a proper a M vehicle, it only handles like one! It is just insane and ridiculous, so what is the point? Hamann however adds exactly that bit of missing flavor to the existing package making it 100% extraordinary. Every part of the car covers the same level of insanity or even more. Ok, you could say the looks are overkill, it is insanely fast and the setup is out of the ordinary, but perhaps that is exactly what the X6 M is all about. Hamann used it to its full potential and created a package that suites the basic setup better than ever. In the end BMW should stick to doing what it knows best with its M cars, do not go beyond and just try, if you need a step further ask Hamann instead.